Ahmed Mohamed, the teen who was arrested for bringing a self-made alarm clock to his Texas school on Monday, was scared during the time of his arrest, but now sees the incident as an opportunity to fight for other people who can’t stand up for themselves. The 14-year-old was a guest on Thursday morning’s “Good Morning America,” and host Robin Roberts asked the teen about the incident and its aftermath. Mohamed was proud of the clock he had made with a circuit board with wires leading to a digital display, and wanted to show it to his teachers at MacArthur High School in Irving, Texas. However, one teacher alerted authorities when she mistook his creation for a bomb, and Mohamed was put in handcuffs shortly after. But realizing there was no imminent threat, the boy was released. After repeatedly telling law enforcement that it was indeed a clock, he was interrogated and wasn’t able to call his parents during the investigation. Since the incident, the #IStandWithAhmed hashtag started trending on Twitter. President Obama has invited Mohamed to bring his alarm clock to the White House on Twitter, and multiple Silicon Valley tech companies reached out to him. But Mohamed was most excited to hear from the Massachusetts Institute of Technology: “I dream about going there.” But Mohamed intends on taking the president up on his offer in the near future. 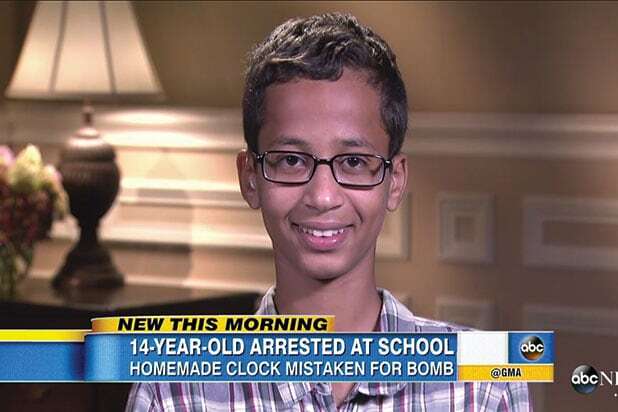 Now suspended from school, Mohamed has some time to think about his future plans and inventions, but for now, the clock has stayed with the police. However, he said that this incident won’t stop him from carrying out his passion for engineering in the future.